Zenith adds rose gold to its Defy Classic for the first two-tone piece in the 41mm Defy Series. 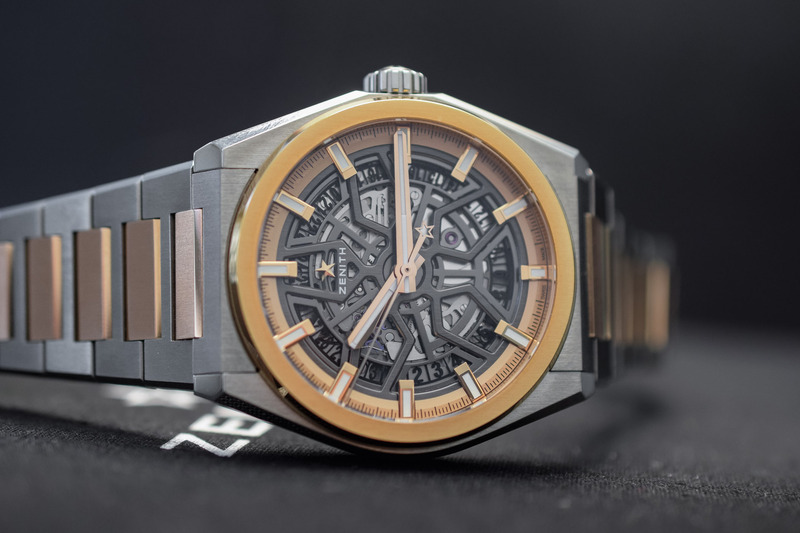 Following up on its well-priced/well-executed titanium Defy Classic Skeleton from 2018, Zenith has added an embellished version with rose gold, which is also the first two-tone 41mm Defy model. The titanium bezel has been replaced with 18k rose gold along with links in the integrated titanium bracelet. The same sporty look with an edge from the Defy Classic remains intact with the two-tone version, but the upscale aesthetic is targeting a more “coat and tie” clientele. The openworked (skeleton) dial is the only option this time around, removing the second blue sunburst dial from last year’s Defy Classic. The core product may be the same, but the cosmetic changes make a big difference to the overall package. 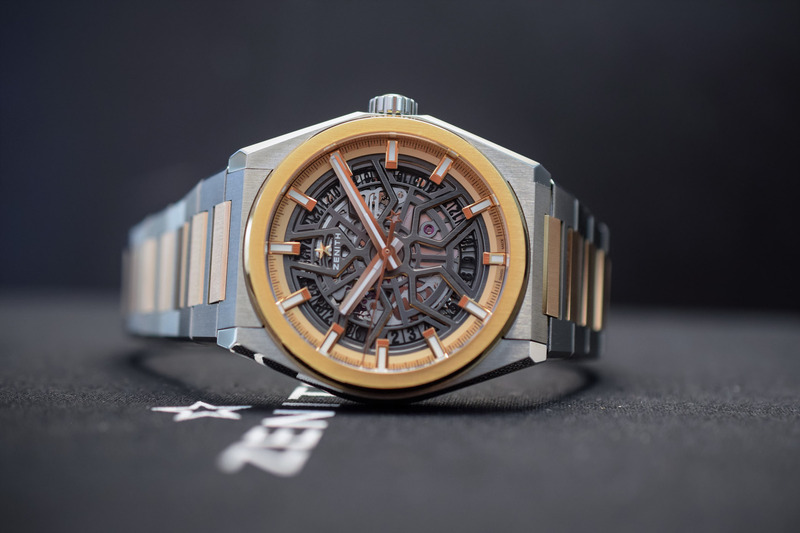 Let’s take a closer look at the Two-Tone Zenith Defy Classic. 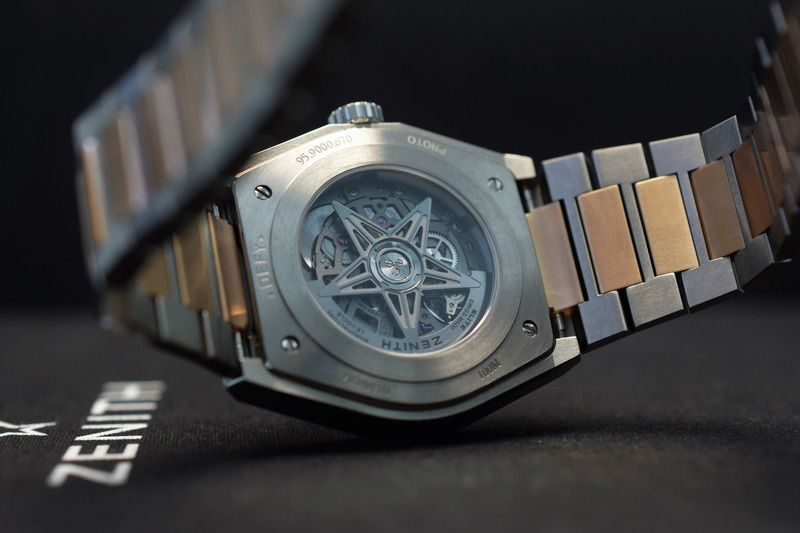 The open skeletonized dial is the first of three details that reflect the brand’s star-shaped logo. 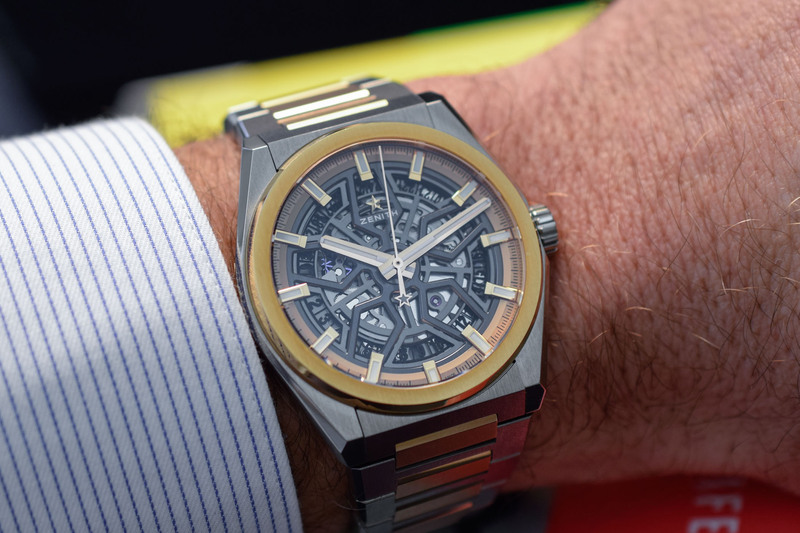 The dial itself is shaped like a star (reminding us of the brand’s logo), falling (mostly) unobtrusively behind the gold-plated hands with a matte grey finish. The faceted hands and indices (also gold-plated) are filled with Super-LumiNova SLN C1. The central seconds hand has a star counterweight, adding the second star detail. A golden minute track spans the outer perimeter and the indices extend beyond it and into the branches of the openworked dial. A date disc is visible inside the minute track with the correct day of the month featured at 6 o’clock. The aforementioned 18k gold bezel frames the new gold details within the dial and the titanium bracelet (with folding buckle) has multiple 18k rose gold central links that complete the watch’s two-tone aesthetic. 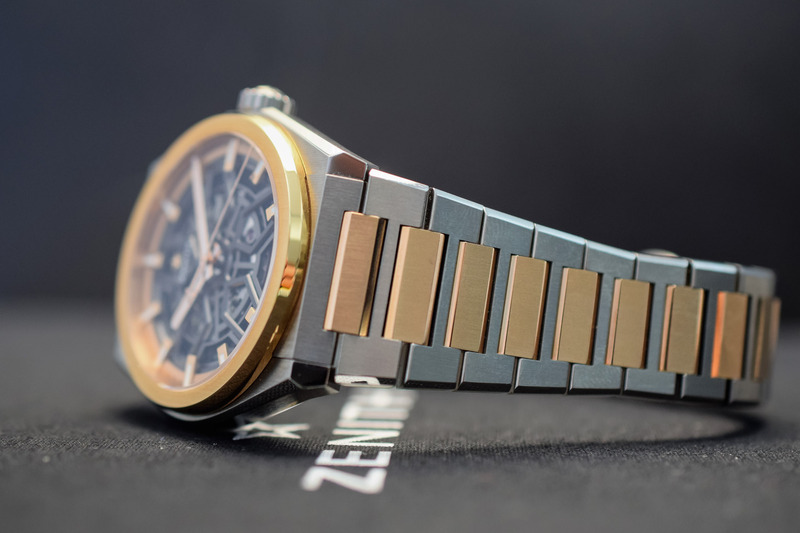 The 41mm brushed titanium case has the same shape and dimensions as the Defy Classic, with angled, chamfered sides and an integrated titanium/rose gold bracelet – in this perspective, it can be seen as Zenith’s take on the luxury sports watch, with a shaped case, a round bezel and an integrated metallic bracelet. 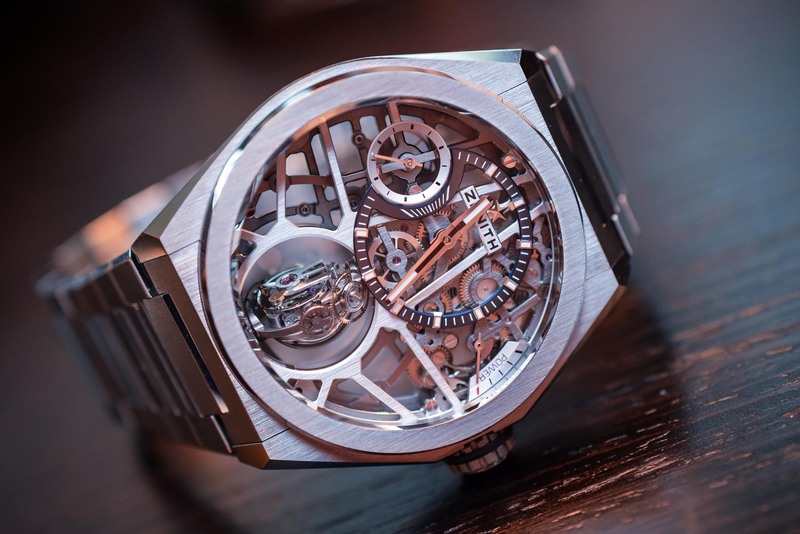 The domed sapphire crystal has an anti-reflective coating on both sides and there’s a sapphire crystal exhibition caseback displaying a rather unique automatic calibre. The case is water-resistant to 100 metres. 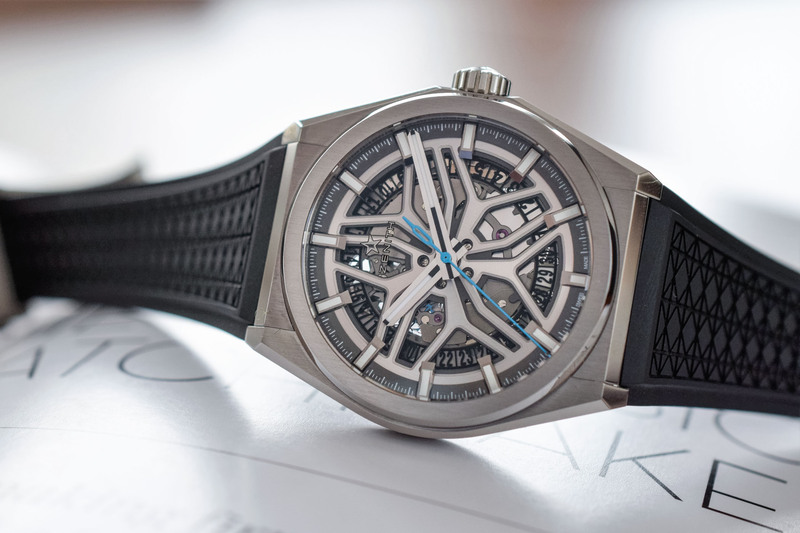 The movement is the same as the one found in last year’s Defy Classic – Zenith’s in-house Elite Calibre 670 automatic. 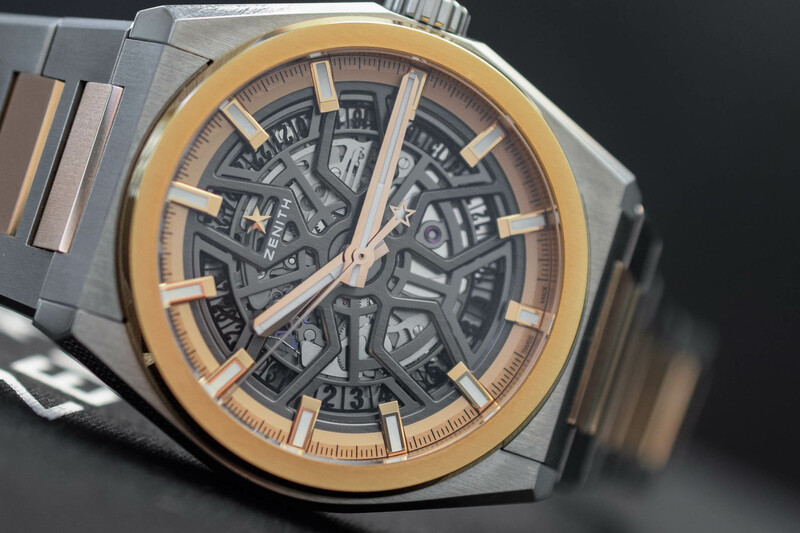 The first thing you’ll notice when viewed through the caseback is the custom star rotor with satin finishes, providing the third and final star logo detail. It has 27 jewels, beats at 28,800vph (4Hz) with a (minimum) 48-hour power reserve. Functions include central hours, minutes and seconds with a date complication at 6 o’clock. The movement also has a silicon escape wheel and lever, which are impervious to magnetic interference and both lighter and harder than steel. 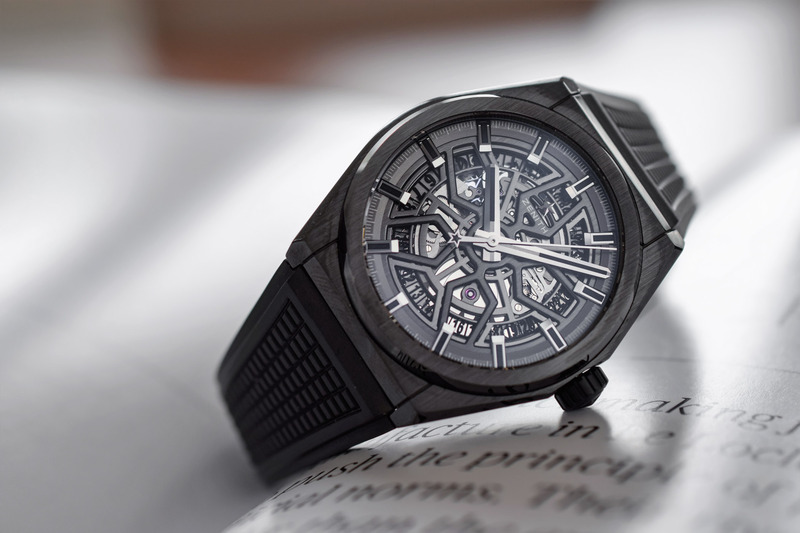 On the wrist, despite the rather restrained dimensions, the Zenith Defy Classic Skeleton is a watch with presence and power. It wears comfortably on most wrists but makes an impression, especially in this new colour combination, more luxurious and also more “visible”, due to the bright gold accents. Yet, the two-tone style suits perfectly the concept of a more modern, bolder luxury sports watch and the gold accents on the dial are a nice addition for those who found the original model too grey (it was indeed entirely made in shades of grey). Plus, in all fairness and even though it doesn’t suit most watches, two-tone is usually quite a cool feature on shaped sports watches – and it is here. The contrast between the greyish and cold titanium and the warm rose gold is also pleasant. 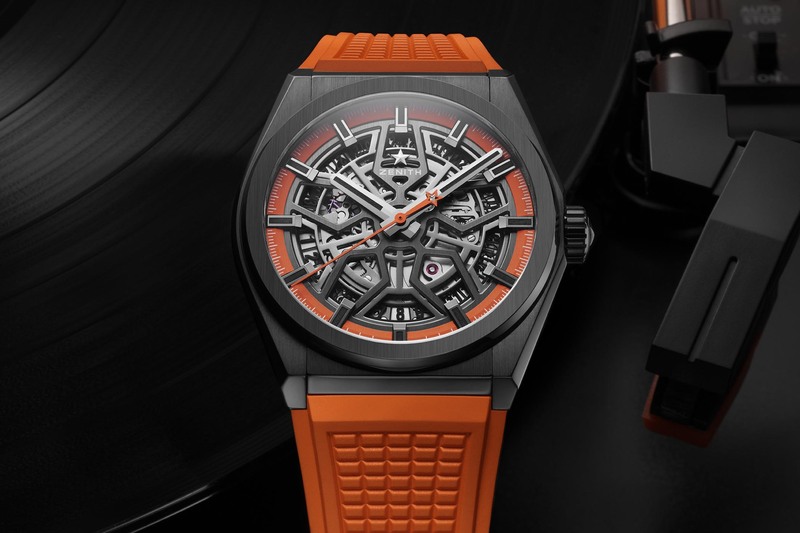 The new Zenith Defy Classic Skeleton Two-Tone is rather surprising on the wrist. It certainly adds some bling to the monochromatic look of the original model but also gives the new sports watch a dressier vibe. The added (and multiple) rose gold accents increase the price from last year’s model (CHF 7,500) to CHF 15,500 or EUR 14,700. More details at www.zenith-watches.com.